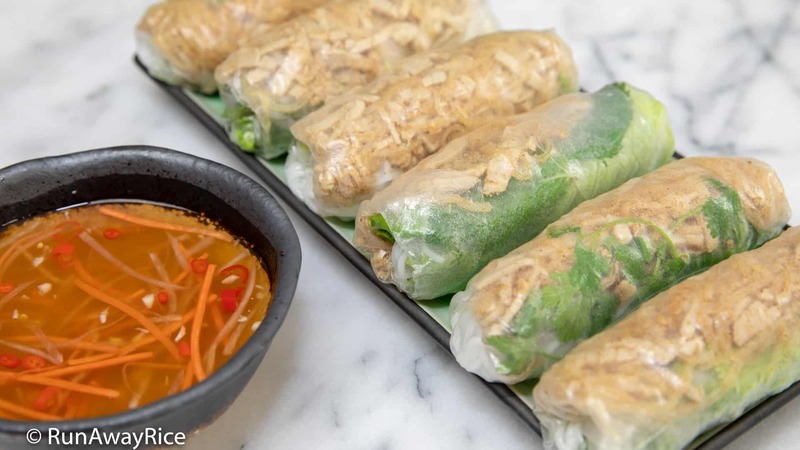 Shredded Pork Skin Fresh Springs Rolls (Bi Cuon) is a popular restaurant dish and with this easy recipe, you can make these wonderfully refreshing rice paper rolls at home. The shredded pork and pork skin is savory and so flavorful. Encased in delicate rice paper and loaded with abundant greens, herbs and springy rice noodle, the Shredded Pork Skin Fresh Spring Rolls are light and refreshing. Enjoy the springs rolls dunked in savory sweet fish sauce dipping sauce with carrot and radish pickles. This is an amazing appetizer bursting with flavor and freshness. Enjoy! Use cooked shredded pork skin. 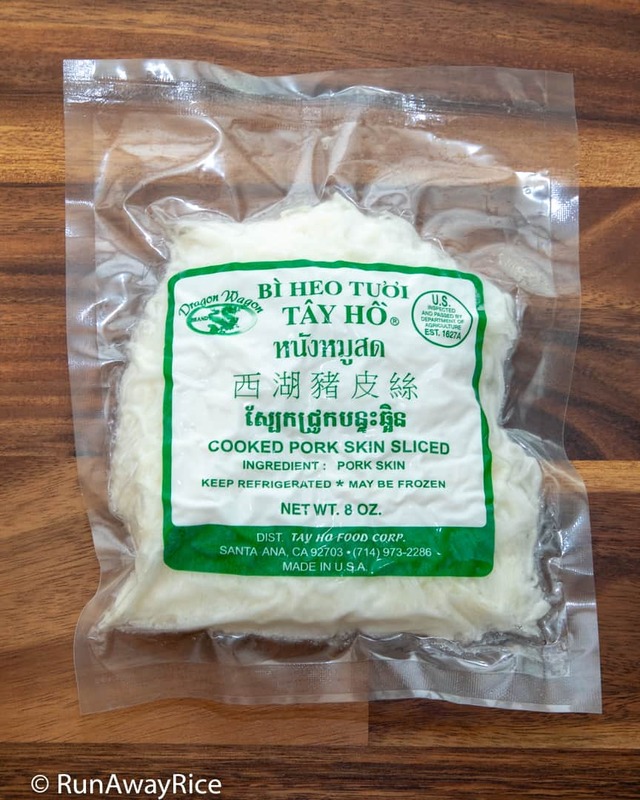 Most Vietnamese grocery stores sell shredded pork skin in the freezer or refrigerated section. Allow the pork skin to thaw completely before using. 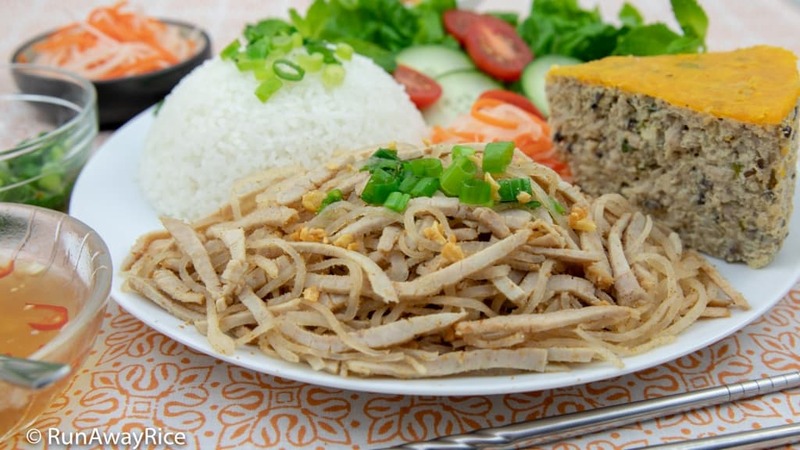 The shredded pork skin should be completely dry before combining with the roasted rice powder. Otherwise, it will clump rather than coat the pork skin. I use a salad spinner to remove the excess water. It does a great job! (Check out this post for some creative ways I use my salad spinner: My Top 5 Uses for a Salad Spinner (and It’s Not Just for Salad). Alternatively, pat the shredded pork skin dry using a clean towel. You may be tempted to add more roasted rice powder because it smells so wonderful. Don’t over-do it! 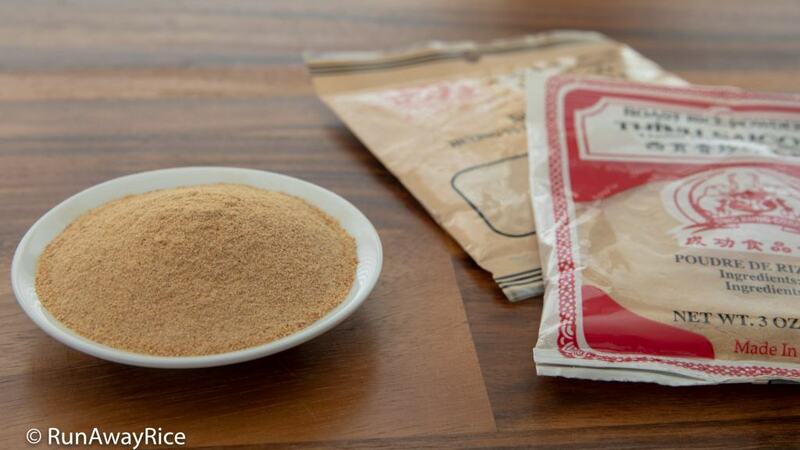 Too much roasted rice powder could make the dish taste gritty and sandy. For the shredded pork skin, I like using thin-cut pork loin or pork loin chops. These cuts are fairly lean yet still flavorful. Thin-cut meat marinates faster and requires less hand-slicing later. You can definitely use other cuts and bigger chunks of pork. If using thicker cuts, increase the marinating time for more flavor. It’s important to season the shredded pork skin first as it’s fairly bland. Once everything is combined together, the shredded pork skin and marinated pork are both evenly seasoned for balanced taste. 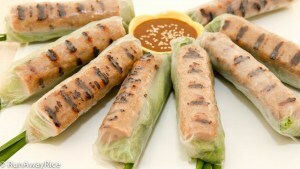 The pork is not heavily salted as the fresh spring rolls are commonly served with fish sauce dipping sauce. I really like the Three Ladies Brand rice paper, size 22 cm. 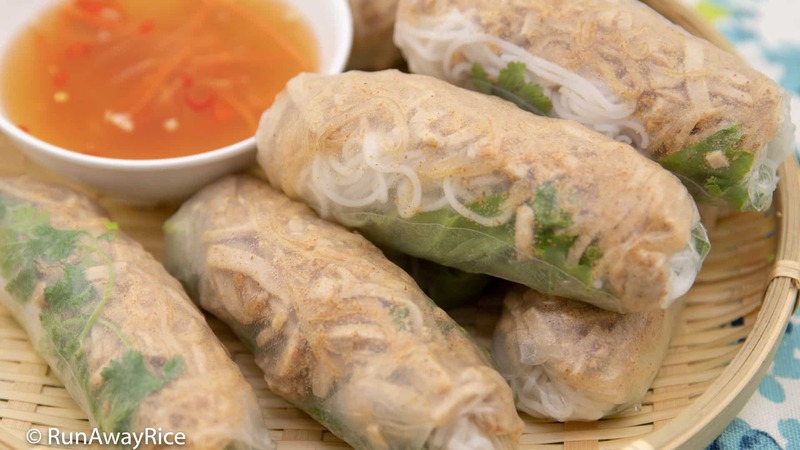 The rice paper is made with a combination of tapioca starch and rice flour and has a light and stretchy texture. There’s no wrong ingredient to put into a fresh spring roll. My rule is: If you love it, use it! 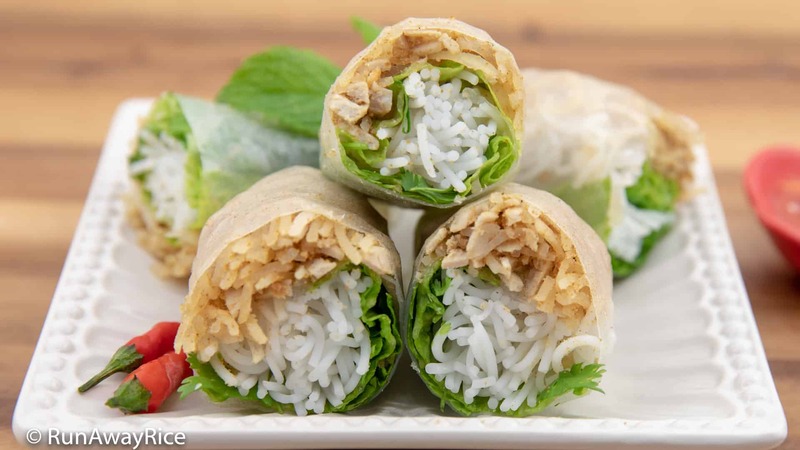 My Shredded Pork Skin Fresh Spring Rolls include the basics: rice vermicelli, green leaf lettuce, cilantro and spearmint. Some other tasty fillers are cucumbers, carrots, or jicama. For a carb-free option, omit the rice noodle or replace with bean sprouts, spaghetti squash or a spiralized vegetable like zucchini. 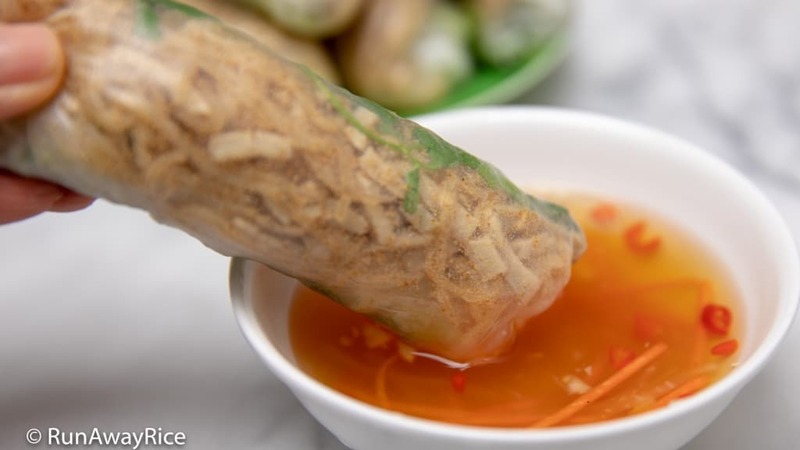 Shredded Pork Skin Fresh Springs Rolls / Bi Cuon is a popular restaurant dish and with this easy recipe, you can make these wonderfully refreshing rice paper rolls at home. The shredded pork and pork skin is savory and so flavorful. Encased in delicate rice paper and loaded with abundant greens, herbs and springy rice noodle, the Shredded Pork Skin Fresh Spring Rolls are light and refreshing. Enjoy the springs rolls dunked in savory sweet fish sauce dipping sauce with carrot and radish pickles. This is an amazing appetizer bursting with flavor and freshness. Enjoy! Transfer the shredded pork skin into the colander and bowl of a salad spinner. Add 1/2 Tbsp salt and 1 Tbsp vinegar. Gently combine together. Swirl the pork skin in cold water and then drain. Rinse the pork skin again. Use the salad spinner to remove any excess water. Transfer the pork skin onto a large plate lined with paper towels. Allow to air-dry while continuing with the next steps. Smash the garlic cloves and finely chop. Transfer the chopped garlic into a small skillet. Add 2 Tbsp vegetable oil. Over Medium heat, stir-fry the garlic until just golden, approximately 3 minutes. Transfer the fried garlic into a small sieve separating the garlic and oil. Set both aside for now. Transfer the pork loin into a large pan or plate. Sprinkle 1/2 Tbsp salt and 1/2 Tbsp vinegar on the first side. Lightly rub the mixture onto the pork. Flip the pork onto the other side. Sprinkle another 1/2 Tbsp salt and 1/2 Tbsp vinegar and rub again. Gently wash the pork pieces under cold running water, rinsing away the salt and vinegar. Pat the pork dry using paper towels. In a measuring cup, add the coconut water, fish sauce and 1/4 tsp ground white pepper and combine together. Pour the marinade into a large dish. Transfer the pork into the dish. Flip the pork pieces so both sides are evenly coated with the marinade. Heat a large skillet over Medium heat and when hot add the remaining 1/2 Tbsp vegetable oil. Transfer the marinated pork into the skillet. Cook on the first side for 2-3 minutes. Flip the pork and continue cooking on the second side. The natural pork juices and coconut water should create a caramel sauce in the skillet. Flip and rotate the pork a few times coating it in the sauce. Continue pan-frying until the pork is fully cooked, approximately 5-6 minutes total cooking time. Transfer the cooked pork to a plate and allow to cool completely. 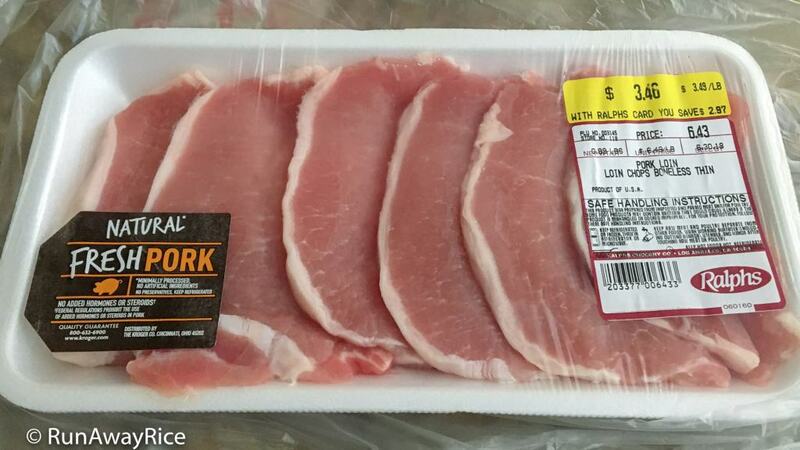 Cut the pork into thin strips. Transfer the shredded pork skin (prepared earlier) into a large bowl. Using scissors, cut the strands into shorter lengths. Add 1/4 tsp salt, the remaining 1/4 tsp ground white pepper, 1 Tbsp roasted rice powder and 1/2 Tbsp fried garlic (made earlier). Toss together making sure the pork skin is evenly coated with roasted rice powder. Add the thinly sliced pork loin along with the remaining 2 Tbsp roasted rice powder and remaining fried garlic. Toss together combining well. Add 1 Tbsp garlic oil (prepared earlier) and combine together. Dip a sheet of rice paper in warm water, wetting it completely. 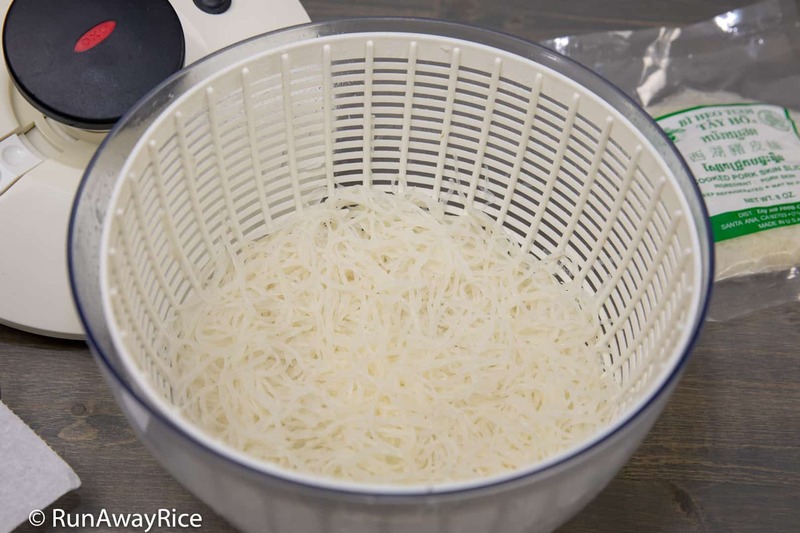 Shake off the excess water and place the rice paper on a flat surface. On top of the rice paper, add 2-3 mint leaves, a 4 inch section of green leaf lettuce, 2 sprigs cilantro, 1 oz rice vermicelli and 1 oz shredded pork skin. 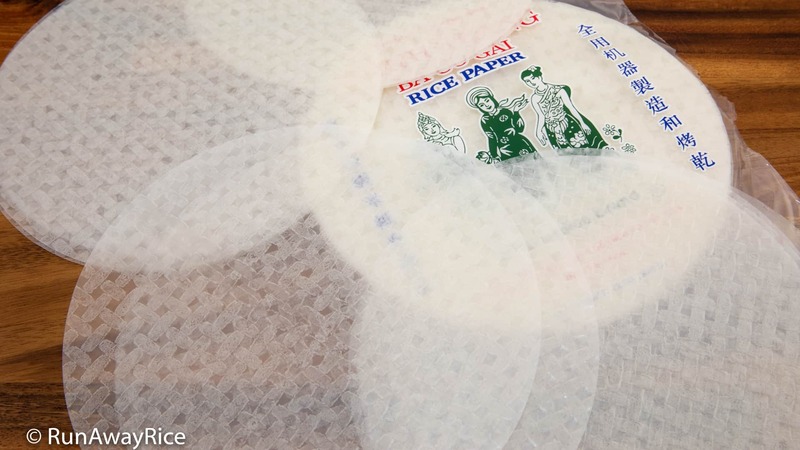 Carefully lift the sides of the rice paper and fold into the center. 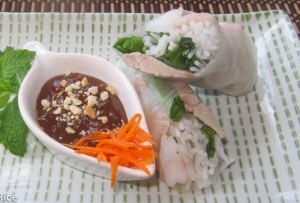 Starting at the end closest to you, roll up the rice paper tucking in all the ingredients. Use medium pressure when rolling. Continue with the same steps to making the remaining rolls. 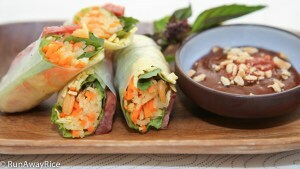 Serve the Shredded Pork Skin Fresh Spring Rolls with fish sauce dipping sauce and carrot and radish pickles. Refrigerate any remaining portions and enjoy within 3-4 days. If frozen, allow the pork skin to thaw completely before using. The shredded pork skin should be completely dry before combining with roasted rice powder. Otherwise, it will clump rather than coat the pork skin. Don't add too much roasted rice powder. It can make the dish taste gritty and sandy. It's important to season the shredded pork skin first as it's fairly bland. Once everything is combined together, the shredded pork skin and marinated pork are both evenly seasoned for balanced taste. 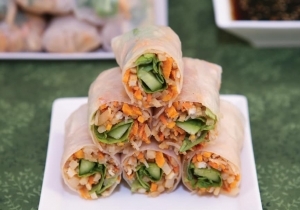 There's no wrong ingredient to put into a fresh spring roll. Use the vegetables you enjoy. For a carb-free option, omit the rice noodle or replace with bean sprouts, spaghetti squash or a spiralized vegetable like zucchini. Make an amazing rice plate featuring shredded pork skin with broken rice, egg meatloaf and grilled lemongrass pork chops, scallion oil, carrot and radish pickles and fish sauce dipping sauce. Love this recipe chi and so happy I know how to make it now. I thought it was too difficult for me to make but it turns out it was pretty easy. My hubby and kids approved and said it’s better than the restaurant we go to. Thanks for sharing your recipe!